Slammed by winds and inundated with rain from devastating Hurricane Irma in 2017, Hawks Cay resort in the Florida Keys was forced to close and rebuild as a result of the devastation. While most of the structures on the 60-acre property held, the heat and humidity of the subsequent days created a breeding ground for mold. It took $60 million in remediation and renovation to open the refreshed resort ten months later. 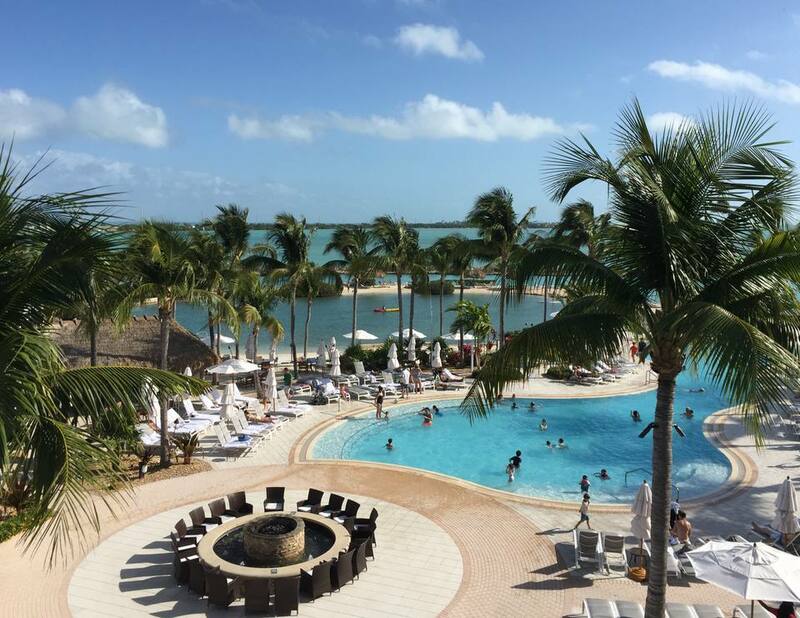 Located on Duck Key, half way between Key Largo and Key West, Hawks Cay is an exceedingly family-friendly resort. Depending upon when you visit, children may outnumber adults. And with a big swimming pool (shown above), resident dolphins to observe and interact with, spa access, and the Camp Hawk kids' program, the property is a haven for small fry and the adults that wrangle them. The resort features 177 guest rooms and suites, plus two- and three-bedroom villas that bring the count just over 400. Units in the main area have balconies or patios that overlook the water or landscaped gardens and pools. Large showers, big enough for two, have an overhead waterspout. Adult couples intent upon a romantic (i.e. childfree) getaway here will need to do some defensive planning. You'll want to reserve a room or suite (or perhaps the luxurious penthouse) with a king-size bed in Oasis Cay, the resort's aptly named childfree section open to those 21 and older. Oasis Cay boasts its own Tranquility Pool, hot tub, cabanas, lanais, bar, dining area, and fire pit where you can unwind undisturbed. Sixty-one Prime is located right off the lobby at the end of a long bar. Although the restaurant's prices are upscale and the steak and seafood offerings sophisticated, diners dressed in shorts and T-shirts are welcome, as are parents with strollers. Angler & Ale, a short walk from the main hotel and accessible by the free tram, serves fresh seafood, beer and burgers. One scrumptious dish is the tuna nachos, seared and blackened rare tuna that arrives on a bed of crispy wontons spiced with wasabi cream and garlic chili aioli. Water and soda are served in Mason jars, but the waiter will replace them for real glassware upon request. In-room dining is also available, although the menu is limited. If you’re the type that loves to swim with dolphins, three of those mammals live and frolic at the Dolphin Connection on property. It's the only resort-based dolphin program in the continental U.S. with complimentary daily viewings. One of the aquatic mammals accidentally escaped through a hole in the fence a few years ago and swam back and forth, begging to get back in. Hawks Cay is also a place to go kayaking, kite boarding or standup paddleboarding in the private lagoon or further out in the Gulf of Mexico. Snorkeling, scuba, and snuba in and around the resort may also lure you into the warm turquoise waters. The Cliff Drysdale tennis program manages lessons and activities at the eight lighted tennis courts. Visits to the Calm Waters Spa and Fitness Center are included in the resort fee. Services and treatments, such as a couples massages using organic aromatherapy oils, are available for a price. Spectacular sunsets are offered free of charge. The main activities outside the resort are all about being on or in the waters that surround Duck Key. Diving expeditions, world-class fishing, and sunset cruises are among the most popular ways to enjoy the turquoise waters of the Atlantic and Gulf. The 106-mile Florida Keys Scenic Highway connects the state's mainland with Key West and all the other Keys in between. A ten-minute drive from the resort in Marathon, visit Florida Keys Aquarium Encounters to swim with the fishes in this aquarium park. At the nearby Turtle Hospital, learn how the staff rehabilitates endangered sea turtles and see some of their happiest patients up close. Treat yourselves to lunch afterwards at Keys Fisheries, an informal eatery with the freshest bounty of the sea. Top your meal off with a slice of key lime pie. Couples can be married in a gazebo beside the Dolphin Connection, poolside, or on a lawn overlooking Tom’s Harbor. Destination weddings here normally number 20-30 guests. Ask the resort to coordinate arrivals, accommodations, receptions, and the ceremony itself. Is Hawks Cay Right for You? Duck Key is an enclave unto itself. So either be content with staying in a place that is not adjacent to wild nightspots, restaurants and the like, or plan to head up or down the highway for nocturnal adventures. The resort is not all-inclusive so figure on paying big-city prices for meals and drinks. Note that although Hawks Cay positions itself as a luxury resort, certain items that guests accustomed to this level of travel may be disappointed. There is no turndown service, no movies on demand, and no minibar. If the resort appeals but you prefer to not be inundated with children, strategically plan your visit for a time when kids are typically in school rather than during their breaks. The resort is about a one and one-half hour drive from Miami. Originally reviewed by Clint Brownfield.